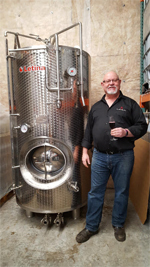 Gougér Cellars of Ridgefield is the first winery in Clark County to have a high pressure tank made specifically for producing sparkling wines. The tank was custom made in Italy and took over 6 months to receive. The tank will enable Gouger Cellars to expand their sparkling wine offerings which already include a Sparkling Rose and Sparkling Pinot Noir. Gougér Cellars was established in 2009 and produces premium international awarded wines from grapes sourced from two states. Winemaker, Gary Gougér, enologist (winemaker) graduated from the University of Adelaide, Australia, and is known for sparkling and bold red wines such as Zinfandel, Syrah, Petite Sirah, Malbec, Cabernet Sauvignon, Merlot and Sparkling Rosé and Sparkling Pinot Noir. Gougér Cellars is at 26505 NE 10th in Ridgefield.